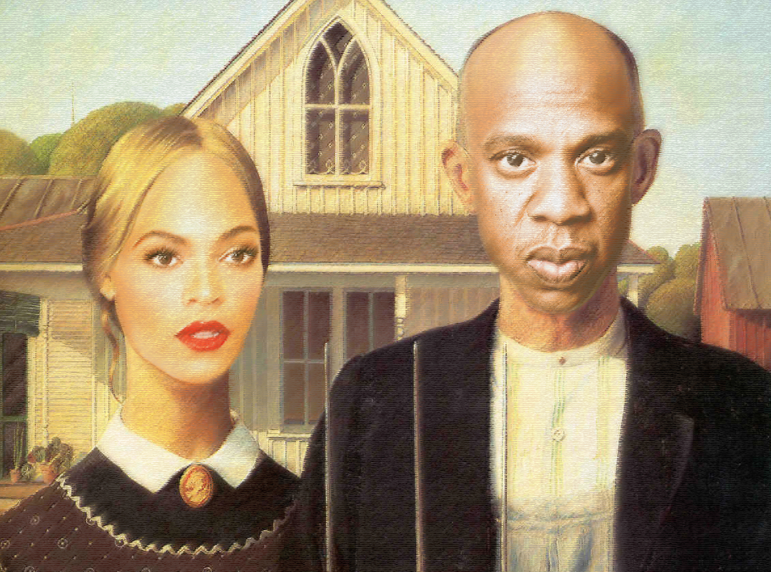 Beyoncé and Jay-Z in Grant Wood’s American Gothic. Just when you thought that pop culture power couple and American music icons Beyoncé and Jay-Z couldn’t get any more famous, someone decided their images were worthy of being photoshopped into famous paintings. The Carter Family Portrait Gallery is one of the best things to happen to Tumblr in recent history, and features Beyoncé, Jay-Z, and even their daughter Blue Ivy, as the focal points in some of the art world’s most significant works. The Carter Family Portrait Gallery is a Tumblr page dedicated to Beyoncé and Jay-Z that pays homage to their reign over pop culture by inserting their faces into iconic paintings from myriad artistic movements. You’ll find images like ­Botticelli’s The Birth of Venus, Leonardo da Vinci’s Mona Lisa, and Gustav Klimt’s The Kiss (Lovers) with Beyoncé’s face overlaid atop the original image, making for a somewhat humorous, glorious homage to Queen Bey. Though The Carter Family Portrait Gallery is very Beyoncé-heavy, there are plenty of masterpieces featuring Jay-Z’s cool visage as well. His face can be found in Grant Wood’s American Gothic, and Pablo Picasso’s The Old Guitarist. The Carter family is playfully photoshopped into American Pop Art, Renaissance masterpieces, Baroque paintings, and more, and features classic works from artists like Millais, Frida Kahlo, Andy Warhol, Edvard Munch, and Johannes Vermeer. The Huffington Post calls The Carter Family Portrait Gallery “a study in well-tuned anachronism,” and despite It’s Nice That’s acknowledgement of the “occasionally questionable Photoshop skills combined with a sketchy knowledge of general art history,” the publication admits that the Beyoncé portraits are pretty awesome. With entire art shows dedicated to everything from cats to Nicolas Cage, it almost seems strange that something like The Carter Family Portrait Gallery didn’t come along sooner. Make sure to head over to Tumblr to see all of the masterful paintings that were given the Beyoncé and Jay-Z pop culture treatment. Images: via The Carter Family Portrait Gallery.